Who owns your lake? And what kind of lake regulations could the answer mean for you as a homeowner? This question doesn’t even occur to most people. But if you are considering buying a lake home, this is something you absolutely, positively need to know. Contrary to popular belief, lakes are not undesignated public land. They are typically owned by government or private entities. Each lays down their own set of rules and guidelines for homeowners. 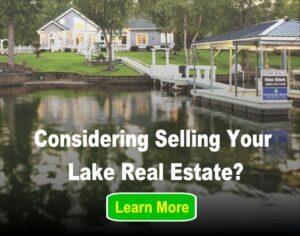 When shopping for a lake home, you can save a lot of stress by finding out who owns your lake, and the rules they have. Most large, developed lakes in the United States are owned or maintained by utility companies or the United States Army Corps of Engineers. They may also own parts, or all, of the shoreline. Homeowners along the shoreline may own their land outright, or have it in a long-term lease. Do your homework, and always read the fine print! Here is a play-by-play on the most common types of entities that control lakes in the United States. Many of the larger lakes in the United States feed hydropower dams that generate electricity. According to the Federal Energy Regulatory Commission, there are currently more than 1,700 of these dams in the United States. Famous hydropower lakes include Lake Mead in Arizona/Nevada, the Sam Rayburn Reservoir in Texas) and Clarks Hill Lake in Georgia/South Carolina). These lakes are often, but not always, owned by the utility company that operates the dam. The company oftentimes owns a portion of the shoreline, as well, or retains property rights along the shoreline. Lakes that feed hydroelectric dams will often rise and fall with the seasons, as energy usage fluctuates. Check with the utility company to check on the lake level. For example, the Tennessee Valley Authority maintains a website to let visitors check on lake levels and planned water releases. The US Army Corps of Engineers governs more than 450 lakes in 43 states. They manage these for flood control, recreation, preserving natural wildlife and recreation. They manage many of the hydropower lakes, as well. On these lakes, some, or all, of the homeowners’ land may be owned by the Army Corps of Engineers, and leased to the homeowners. Leases can range from 20 to 99 years. Take note: in these cases, mortgage lenders will never approve a mortgage longer than the lease. For example, banks will never approve a 30-year mortgage for property on land with a 25-year lease. Serious restrictions on any portion of the property designated “public land.” This includes fence construction, roads, landscaping, gardening, etc. Agencies keep this land, usually defined as a certain distance from the shoreline, clear for flood control. It can be privately owned, but has certain restrictions in order to guarantee the flow of water during flood conditions. Landowners cannot build fences across flowage easement land; they can, however, build them up to the edge of it. 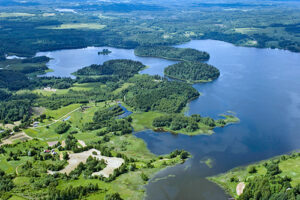 Homeowner’s Associations control many of the smaller, private lakes in the United States. These associations have very different concerns than the federal government or utility companies. Their lakes don’t serve a major public interest. Rather, people use these lakes primarily for their beauty and personal enjoyment. Because of this, regulations focus more on the lake’s aesthetics and culture. Homeowners often have more legal rights. At the same time, they can run into problems if any improvements or usage don’t fit within the rules of the homeowner’s association. Even if you have spent years visiting a lake, chances are you don’t know all the aspects of owning property there. Always do your homework before making an offer! This is one reason to work with an agent who specialized in lake property, especially on your lake, when shopping for a lake home. Real estate agents who specialize in lake property know their lake’s quirks, and can help you find the home of your dreams without all the headaches.